New England Track & Trail is a small but growing running club in the Metrowest Boston area. Its members participate in running, triathlon, trail running and trail racing, cross country racing, orienteering, snowshoe racing and more! Interested in coming out to a run or finding out more about our membership? Drop us a line at Ttroll71@aol.com. The race took place on the Franklin Park 5K XC course, ground that Crazy Dave and Fluffy Chris both know well (although they've reached such an advanced age neither could remember the sequence of loops for the 5K). The results? Well, both won their age group with Dave finishing 5th overall, 1st in the 40-50 and Chris two spots behind in 7th overall, 1st in 50-59 age group. (We won't mention that the 60-69 age group winner beat them both and even got a ride home from Crazy Dave!) 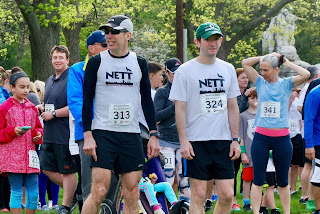 The Parkway Running Club were also out in force supporting the race, which was great to see. Overall it was a really well run event with a very positive feel for a good cause. The work YP is doing with this group is (IMHO) the most impressive bullet on his already (very) long running resume and inspires us all to find more ways we can use our running to make the world a better place. PS--to read more about YP's involvement in the Bulldogs read this article. Nice Job Mini Ponies! And Congrats YP on a successful event!